The European Union ordered Apple on Tuesday to pay $14.5 billion to Ireland in back taxes, plus interest, after finding that the Irish government provided the U.S. company with 11 years of illegal tax benefits. 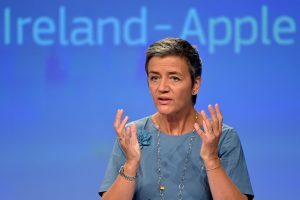 EU Competition Commissioner Margrethe Vestager said an in-depth investigation found that Ireland’s “selective treatment” of the multinational company allowed Apple to pay an effective corporate tax rate of 0.005 percent on its European profits in 2014, down from 1 percent in 2003. “Member states cannot give tax benefits to selected companies – this is illegal under EU state aid rules,” Vestager said in a statement. Both Apple and Ireland vehemently oppose the ruling and plan to appeal. Ireland also resisted the investigation’s conclusion. Noonan announced he will seek Cabinet approval for an appeal, calling the EU’s decision an encroachment on one of its sovereign member states. He also pointed out that Apple employs thousands of people in the region.